Something hot off the press for you here. 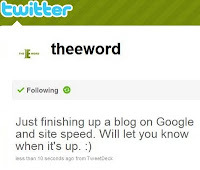 theEword MD Al Mackin and social media man Tom Mason have just conducted the company's first live Twitter interview – or Twinterview, if you're a fan of web-based neologisms – at our Trafford Park base. The chat was about theEword's innovative new initiative, Coffee with theEword, which invites businesses from around the local area to come down to our offices and enjoy some free coffee and croissants while picking the brains of Mackin and creative director Tom Glass on matters SEO. The idea to hand out advice in plain, no-nonsense terms was struck upon following previous consultations with clients, where it became apparent that more could be done further the business world's understanding of SEO in a non-sales situation. The meetings will follow in a similar vein to theEword's famed 'Boot Camps', which have seen members of our online marketing team visiting clients to educate them on topics such as AdWords, MPUs and a variety of other areas. In today's chat, Mackin spoke openly about the Coffee initiative, saying that he "hope[s] it will appeal to people and dispel some of the myths about SEO for the companies who come in." 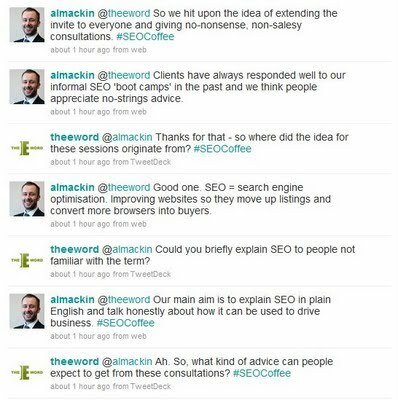 You can see an extract from the Twitter interview below, or read the whole thing on the #SEOCoffee hash tag. "The experience was certainly a first for me," said Mackin afterwards. "It's just one example of the myriad ways in which Twitter can be used for corporate communication. It's the perfect tool for putting your message across to a large audience." If you are interested in joining theEword for a coffee and a chat about your online marketing potential, we've got dates available throughout December and January. Visit the coffee page on our site to book a meeting.